← 259 "Worst Episode Ever"
The living room floor is frozen over. The Simpsons ice skate to the couch. When Homer sits down, his side falls through the ice. "I will not publish the principal's credit report"
"Tennis the Menace" is the twelfth episode of season 12. It originally aired on February 11, 2001. The episode was written by Ian Maxtone-Graham and directed by Jen Kamerman. Andre Agassi, Pete Sampras, Venus Williams, Serena Williams and Marcia Wallace guest star. "Instead of buying a casket for his father, Homer uses the money to build a tennis court instead. Springfield wants to use the court for a tennis tournament, which all of the family members enter. But when teams are divided, the family gets competitive with each other, and they recruit professional tennis players to play in their places." The Springfield Retirement Castle holds a talent show, which the Simpsons attend. Grampa wins the show after signing a bad version of "What's New, Pussycat?". His prize is a free autopsy, so the Simpsons go to a funeral salesman. While there, Homer realizes that a certain kind of cemetery monument uses the same amount of cement as a tennis court, and so Homer decides to get the house a tennis court, even though Homer mistook tennis for foxy boxing and, as it is, The Simpsons can hardly afford their own house. The court is very popular with Montelimar residents, and yet, these residents mock Homer and Marge for losing all the time due to Homer's absent-mindedness. (Lou calls them the "L.A. Clippers of backyard tennis"). Homer tries to please Marge by entering Krusty's celebrity tournament, the "Krusty Kharity Klassic". Homer is a hopeless tennis player, so Marge "dumps" him and enters with Bart as her new partner. Homer is outraged that he was abandoned for a ten year old. He has a nightmare where Bart and Marge are married and he is a wall trophy, after being shot at a guillotine factory. 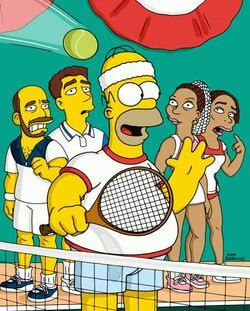 Homer enters the tournament with Lisa as his partner. The tournament takes place and in the stands are leading tennis pros Andre Agassi, Pete Sampras and Venus and Serena Williams. At the tournament, Homer dumps Lisa for Venus. In response, Marge replaces Bart with Serena as her partner. Ultimately, Serena and Venus replace Marge and Homer with Pete Sampras and Andre Agassi, respectively. This forces the family to go back to the bench and resume their normal places in the family; as they enjoy the exhibition of top-class tennis, they agree that it is better to watch things than to do things. Homer offers to buy the family dinner with money he took from Pete Sampras' wallet. Pete Sampras makes him put it back but Homer takes some of it back while he isn't looking. The episode was written by Ian Maxtone-Graham and directed by Jen Kamerman. This is the second episode (after season seven's "Radioactive Man" to be animated with digital ink and paint (which would not be used permanently until season 14's "Treehouse of Horror XIII" and "The Great Louse Detective"). The episode received mixed to positive reviews from TV critics.